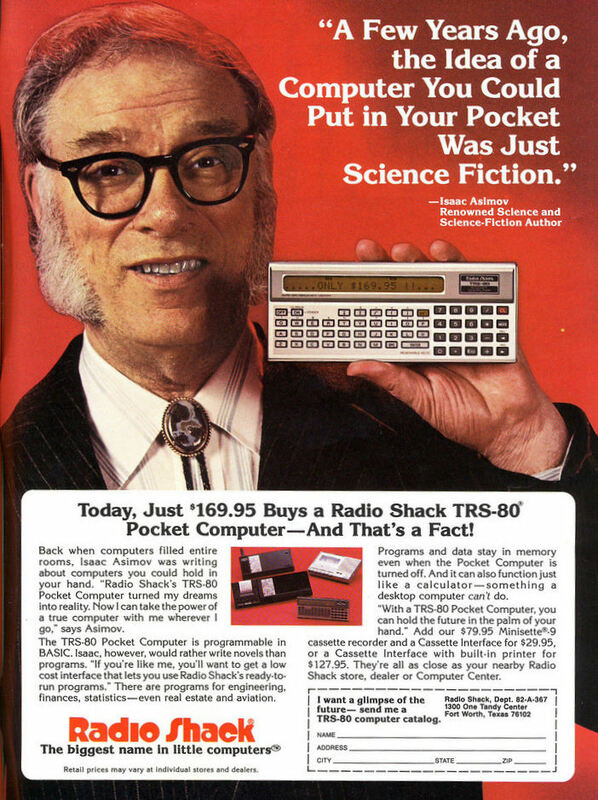 I ran across this ad recently for an amazing new product, promoted by my own favorite science fiction author, Isaac Asimov. Radio Shack’s TRS-80 Pocket Computer turned my dreams into a reality. Now I can take the power of a true computer with me wherever I go. The marketing guys chime in a few paragraphs later. And it can also function just like a calculator — something a desktop computer can’t do. Wait, what!? With a standard calculator included in just about every phone that I can think of, it is hard to imagine a desktop computer ever existing without that ability. Crazy, right? Now that I think of it, it wasn’t too far in the distant past that desktop computers couldn’t be used for voice communications, something a simple phone could do. So what does $169.95 actually get you? 100’s of other features like camera, video capture, streaming video, and get this includes the ability to make phone calls. Sadly though, it can’t make you breakfast… yet. Let me whip out my calculator on my i7 Desktop Computer! The Droid 2 has a 3,906.25 times faster processor (just based on clock rate, not actual computational power) and has 5,592,405.33 times more storage. That seems crazy right? The TRS-80 pocket computer came out in 1980, about 20 years ago. I wonder how people will feel about our state of the art smartphones in 2020? That is assuming we haven’t been taken over by robots gone wild, destroyed ourselves with nukes, or succumbed to a raging nano-plague. But that is all just science fiction. Great old news! Anyway, think about what’s available today compared to 2011 🙂 As we put more mind in the machine, our own mind is loosing the power drop by drop…or at least so it seems.